I have been attracted to cartographies on a number of levels: as foils for the traditional illusionistic treatment of depth in painting; as aesthetic abstractions of real and imagined place and space; as embodiments of states of knowledge and world views; as conveyors of ideologies and cosmologies under the guise of objectivity; as enablers and documents of expansionism and imperialism; and as stages for dismantling the privileging of the measured over the immeasurable. For almost two decades, my paintings moved from aerial views of invented topographies to manipulated diagrammatic spaces influenced by cartographers ranging from Ptolemy and Mercator to Waldseemüller and Gulf War battle plans named after football plays. These representations of remembered and invented spaces embodied elements of paradox, my attraction to and dread of absolutes, and the confrontation between and intersection of conflicting realities, especially those pertaining to gender, the powerful and the disenfranchised, and the analytical versus the intuitive. Some of my map work was included in Denis Woods’ book, Rethinking the Power of Maps (The Guilford Press, 2010. 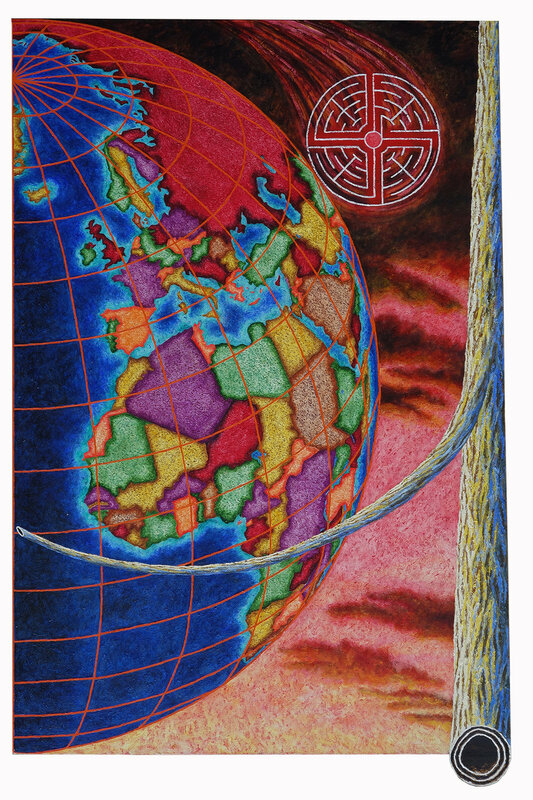 In 2007, I presented works inspired by cartography at the North American Cartographic Information Society Conference in St. Louis, Missouri. In 2010, I gave a related talk for Information Mapping Dorkbot, at Brillo Box as part of the Contestational Cartographies Symposium at Carnegie Mellon University in Pittsburgh. My work has also been featured on the covers of the following issues of Cartographic Perspectives, the national journal of the North American Cartographic Information Society. Mixed media on paper. 8 x 8 inches each. 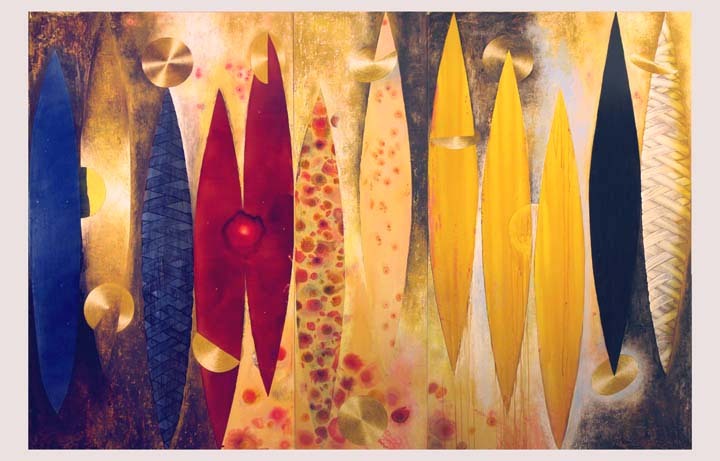 Series of nine works. The questions of “what is the relationship between the map and the territory” or “when is a map not a map, but a picture?” are problematic and sometimes amusing. Korzybski in Science and Sanity states that “the map is not the territory”. The confusion between the map and the territory is also in On Exactitude in Science by Jorge Luis Borges, translated by Andrew Hurley below. This story inspired my Discipline of Geography series of small works on paper. Works like these showed gridded nets (my versions of longitudes and latitudes) that descend in ambiguous purpose. Will they blanket and protect or constrict and oppress the earth? Mixed media on paper, 8 x8 inches. Eventually I arrived at combining maps that had actual physical properties with representations of deep space. Pulse of Rome, The Open Vein was an early awkward attempt to juxtapose multiple treatments of the picture plane. 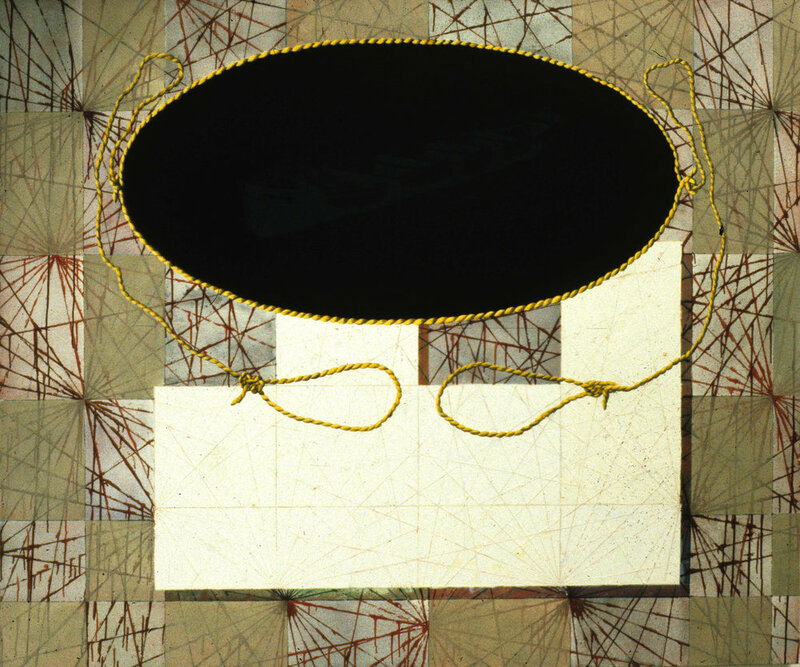 On the right is a flat painting of a deep space, with an actual physical lattice attached to the surface. On the left is a map of Rome, an inherently flat and abstract representation of space made physical by a relief simulating an unfolded map. Painted shadows of the real lattice on the right extend the trompe-l’oeil affect. I chose Rome and maps of other sacred cities like Jerusalem as destinations for pilgrimages, crusades and other religiously motivated journeys to contrast with the agnosticism of the unknown destination. About 48 inches in height. Oil and acrylic on canvas with wood extension. 48 inches width. Paradise and Eden and their garden iterations are suggestive of the Utopian thinking that is at the core St. Sir Thomas More’s Island of Utopia 1516 and that’s at the core of the cartographic imagination, motivating us to go to or build the good place, the perfect world. Hollow Borders embodies this utopic thinking by contrasting an exaggerated volumetric globe with the artificiality of abstract boundaries revealed through arbitrary color assignments to nation states. Prognosis in the Garden contrasts a garden map of manipulated nature with untrammeled space on land or in sky. Processes like staining and dripping introduced chance and surrendered control to contrast the more measured spaces. The centers of these labyrinthine paths are often symbolic locations of transformation or redemption. The most abstract feature of the good place, the destination, is that it is the center of the cosmos, the axis mundi. The axis mundi is often represented by a tree, sacred mound or a sacred city such as Jerusalem. 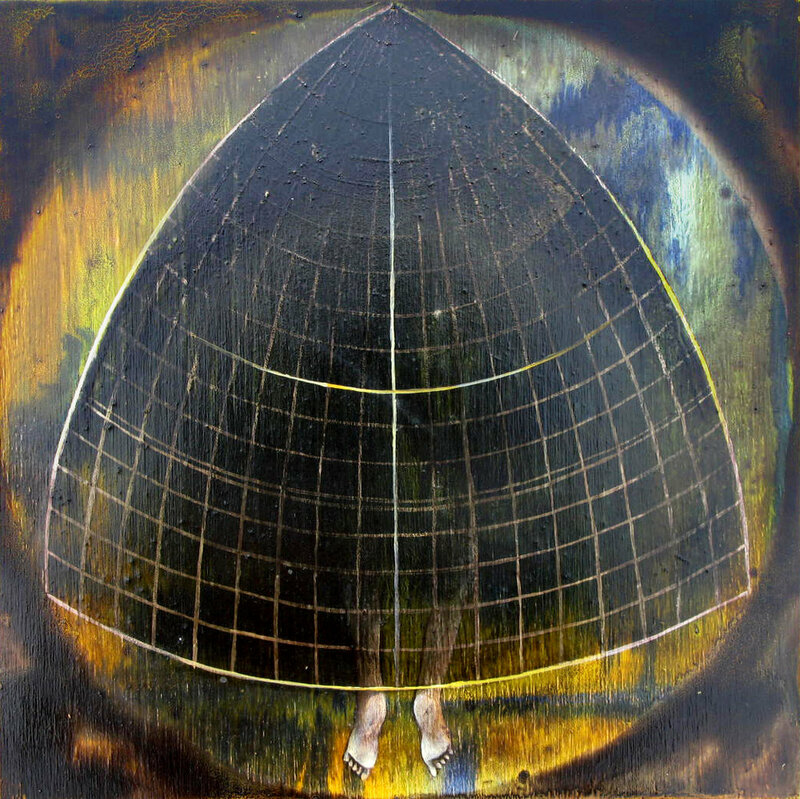 Samuel Y. Edgerton, Jr. calls this perception of the center the omphalos syndrome, the tendency of cultures to see themselves as the center of the universe. We see it on a cosmic scale with any representation of a Ptolemaic system of the universe with Earth at its center. In Gravitational Pull, I used a more literal axis mundi along which a struggle for power ensues. In researching cartography, I was drawn to Ptolemy’s world maps, especially one illustrated as an almond shape framed by a sling. 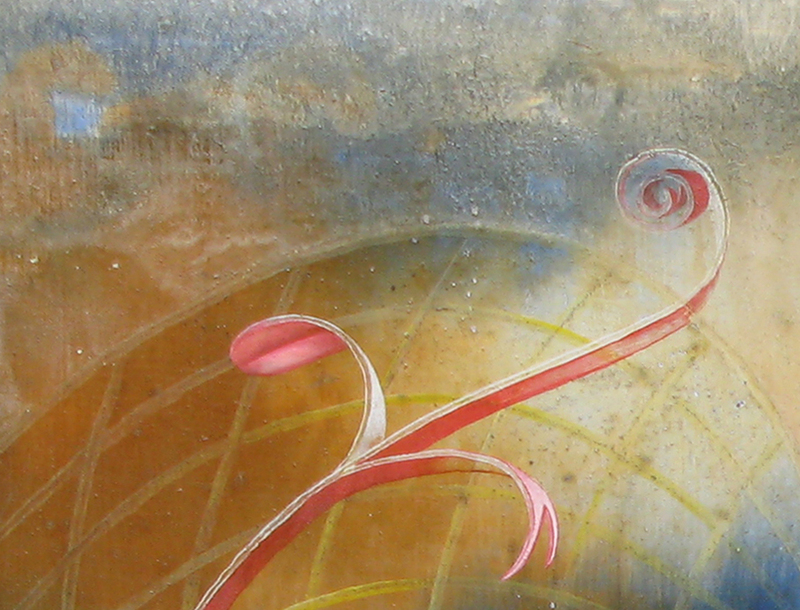 I had been working with the mandorla (the shape created by the intersecting circles of heaven and earth). In the early 1400’s, Ptolemy’s 2nd Century AD Geographia arrived in Europe, concurrently with Brunelleschi’s development of perspective geometry and its application to architecture. The Geographia mapped the entire world and presented all the known information in a standardized way with grid lines of latitude and longitude. Distances and directions could be established between one place and another and even unknown places could be given coordinates. Synthesis of perspective geometry and Ptolemy’s work enabled the grid, an entirely human construct, to be imposed on the world (at least in the west as the grid had actually been used in Chinese maps as early as the 1st century AD. Several cultures used grid systems, systems that require real conventions, negotiations and agreements. They have to be literally conventional. (0 longitude passing through Greenwich). In voiding the center and obscuring the grid, that power might be decentralized. I emptied out the map of all that it purported to measure and represent for several reasons. It was always incomplete anyway, a record of the state of knowledge at the point of its creation and immediately on its way to becoming obsolete. The information presented by maps implied control of the territory represented. Knowledge equaled power; but, as history has shown, that power has often been abused. Ptolemy’s Task 1992 substituted cracked mud for the entire world as it was known, a barrier field that insisted on the here and now, denied that abstract space in which we can mentally wander and conquer in reality, hinted at the often barren and depleting consequences of our exploration. LADY ALICE is titled after Henry Stanley’s portable steamboat that navigated Lake Victoria. It hovers like an apparition in this black hole void amidst another blank chart. Navigational lines on the blank map show the bloody consequences of the Age of Exploration and of Stanley’s own ruthless journey. In Sebastian Munster Typus Universalis after Ptolemy 1540, you see 10 of the 12 directional winds originally designated by Aristotle and usually personified as cherubic faces with inflated cheeks. In VAPOR CHOIR , they become a chorus of voices/emissions. The vapor stains animate or contaminate a world emptied of measurement, a purified or purged atmosphere. They suggest fear of intimacy, the fluids of birth and death, the visceral vs. the virginal. Detail of directional winds as orifices. In Sebastian Munster Typus Universalis after Ptolemy ca 1550, you see 10 of the 12 directional winds originally designated by Aristotle and usually personified as cherubic faces with inflated cheeks. 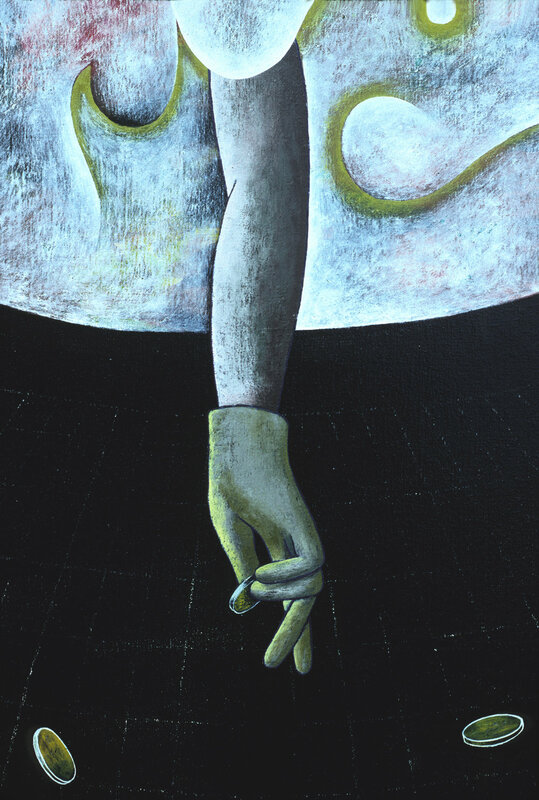 In Casting Lots, these directional winds become gloved hands anonymously enacting an inadequate altruism — toward any imagined need, a need that is infinite. They surround an emptied world, measured only by ghostly traces of longitudes and latitudes. The resulting black hole is not one of nihilism, but a space for re-imagining, reawakening — much like the pregnant absences of the Buddhist plenum void, the empty space full of potential. It is a realm from which anything can spring forth. This image was featured on the cover of Cartographic Perspectives, North American Cartographic Information Society, #63, Spring 2009. From a series that experimented with shapes derived from diverse map projections, particularly the more organically or body-shaped projections into which all sorts of bodily entities or emissions could pour. TRIUMVERATE is based on the Fool’s Cap Map. I experimented with shapes derived from diverse map projections, particularly the more organically or body-shaped projections into which all sorts of bodily entities or emissions could pour. The kidney shapes of Salamanca’s Cordiform Projection became MILK NECKLACE where feminine pain is transformed into ornamental beauty. The kidney stone becomes an irritating grain of sand transformed into a pearl, beauty born of grief or suffering. Intertwining the feminine with types of geometric map projections. This image was featured on the cover of Cartographic Perspectives, the journal of North American Cartographic Information Society, #61 Fall 2008. In this case, the projection reminded me of the grandmother’s skirt at the opening of Gunter Grass’ The Tin Drum, under which Oskar hides. Amnesia Embellished maps an image of collective amnesia with one finger turning blue from loss of circulation rather than remembering that which we so conveniently forget about our own history. Sorority takes the shape of the Waldseemuller World Map 1507 (the first to represent the New World) and feminizes the representation of world, placing the intuitive on equal footing with the analytical. Sinuous braids (from my childhood of five sisters all with long braids) drift or languish over the diminished rationality of the barely visible grid. Pretty Lies appropriates the shape of a 1511 map by Bernard Sylvanus. It speaks of deceit with what started out as forked tongues protecting (or violating?) two different projections of the world. It alludes to the falsity of maps’ presumed objectivity. This image was featured on the cover of Cartographic Perspectives, the journal of the North American Cartographic Information Society, #59 Winter 2008. Oil and acrylic on wood panel, 24 x 24 inches. Dissemination shows a bi-polar globe of the feminine as both active and passive, generator and receiver, trying to incorporate the paradoxes in which one truth is often surrendered to another. The grid eventually reasserted itself. Usually associated with Apollonian reason, it remerges in this series to be repossessed by the feminine. A hand gesture appropriated from Raphael’s Madonna reclaims the latitudes and longitudes in a gentle and demure gesture. The grid is a prevalent motif of modernist painting generally dominated by a male pantheon of artists (like Robert Ryman). My reductivist representations of the world try to disturb, interrupt or subvert that male hegemony, pulling the grid in all directions as in Getting a Grip and Power Struggle. MILK AND OIL converts the poles of two hemispheric projections to breasts, weeping milk and oil. Food and fuel (and lack of such resources, especially with the consequences of climate change,) often motivate armed conflict. In emptying out the shapes of antiquated maps, I retained references to the type of marginal imagery seen in works like Munster’s Typus Cosmographicus Universalis 1532 rather than the territories they framed. Fanciful details of monsters in the margins of maps by Sebastian Munster distract from the painting’s symmetry and centralization. My attraction to maps that assumed shapes of stylized human organs was a way of connecting the intimacy of the body to the global. Heart-shaped maps (i.e. Hacı Ahmet's Map of the World and by Peter Apian’s Heart Map) were sources for my response to the first Gulf War that erupted the year I became a mother. The stories we tell ourselves to justify war preoccupy me to this day. Crusades in the past were bolstered by tales of forced circumcisions over baptismal fonts in Jerusalem. Such tales were told by Pope Urban II to deflect internal strife to an external enemy and to unify warring factions within European Christendom. In the first Gulf War, we were motivated as a nation, just like Crusaders of the past, by other tales (later disproven) of babies ripped from Kuwaiti incubators. HAIL MARY became a feminist pieta juxtaposing the heart (the metaphorical locus of love) with plans and diagrams of aggression along the margins. The directional winds first mentioned by Aristotle (and often characterized by cherubs blowing with puffed-out cheeks) become breast shields, emitting tears of milk in the trajectories of missiles. The latitudes create a kind of target over the black void of the heart. The black items above diagram the Joint Forces Chain of Command and the red elements below indicate the battle plan (named Hail Mary) that won the Gulf War. Hail Mary is also the name of a football play, so, whether in the arenas of war or entertainment, the painting’s title suggests a strange co-opting of the maternal by the masculine. From and To the Land of Milk and Honey was a more general response to the nationalistic/imperialist land of milk and honey spirit of some maps, especially those that downplay the relation between places (and the cultures that inhabit them) that is essential in considering the world beyond one’s personal interests. 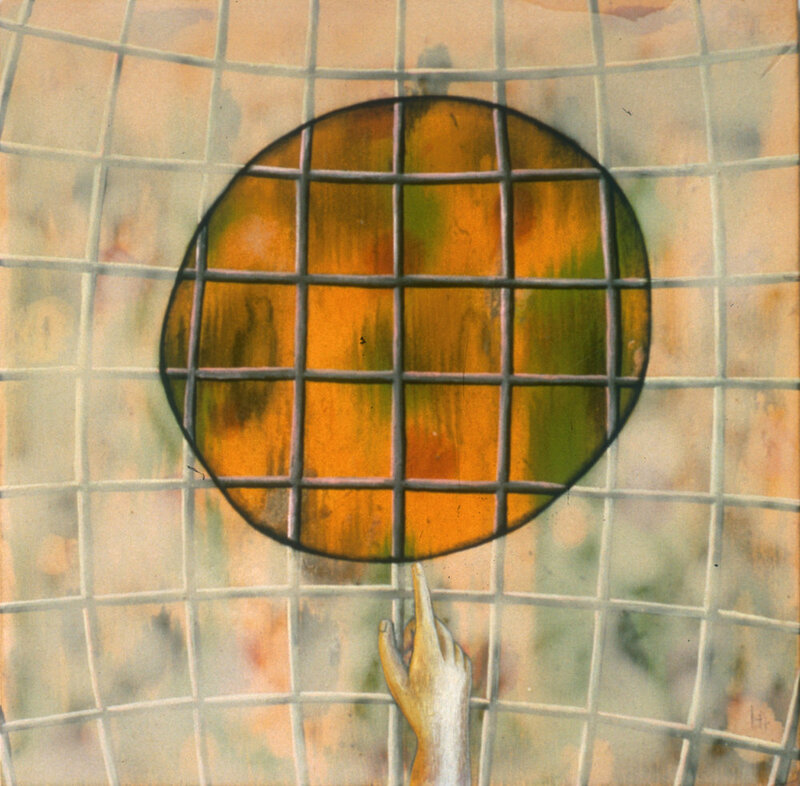 The source map for this painting existed solely for a goal-oriented journey, getting from Point A to Point B with no care for the larger context or orientation. Each piece of the scroll had its own compass rose and one simply followed the path from one section to the next. Fingers pointing every which way also seem to assign blame anywhere else but with ourselves. Oil and acrylic n canvas. 60 x 80 inches. MEASURE IN MUTINY portrays the directional winds as black lungs, blowing and sticking out their tongues at falsely constructed worlds (with a made-up geography) and distorted world views. This image was featured on the cover of Cartographic Perspectives, the journal of the North American Cartographic Information Society, #63, Spring 2009. T-O maps such as Isidore of Seville's tripartite world map of 1472 are emblematic of those maps that did not purport to describe geography or topography but a world view that legitimizes the church or state. The three parts within the “O” (or squared “O”) that circumscribed a “T” stood for Asia, Africa and Europe, the three areas of the known world with the three great rivers. Asia is typically depicted on top as the birthplace of Christ and the original site of the Garden of Eden as in the 12th century edition of Bede's De natura rerum. Seasonal Blindness responds to this T-O structure, presenting our ignorance, indifference and acceptance of inequitable realities as if they were simply phases of the moon. This tri-partite division of T-O maps has been traced to the Biblical division of land between Noah’s three sons, a seminal account of private property and power inherited rather than earned. Under the Skin uses barbed wire to delineate private property. promising pain if trespass occurs. For me, the barbed wire is a secular version of Christ’s crown of thorns that is so often painstakingly rendered beneath translucent flesh in Flemish crucifixions. The palette and transparency of flesh and blood begins to emerge here. Seasonal Sanctity shows the institutional sanctions of inequity. SPECIMENS introduces elements of the body into a kind of carnal cartography that merges the microcosmic and the macrocosmic. I began to incorporate other diagrams of the world like the gores of Waldseemuller’s map of 1507. Slipped Crowns portrays the gores of a hemisphere as wounded and infected membranes, bodies that decay despite their worldly authorities, a reminder to first world countries that they are not immune. 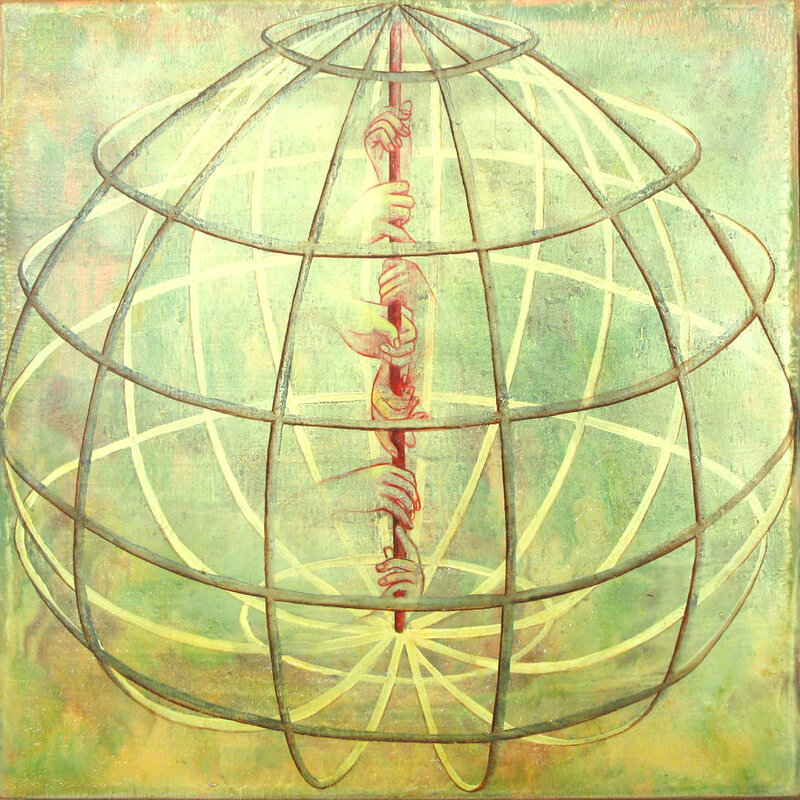 In Repercussions the gores of the globe float in uneasy connection to each other. Like disciples wounded and beatified by shimmering haloes, they couple and decouple, infecting each other with disease and desire, apathy and ecstasy. Embalmed for burial or bandaged for recovery, they vacillate between the corporeal and the ethereal. They are a world body, the body as world, the world as body. Tourniquet at 0 Degrees tries to acknowledge and reverse the map’s typical conversion of dimensional space to two dimensions. Here, the flattened gores of the globe are cinched at the equator(waist), implying a constricted volume. 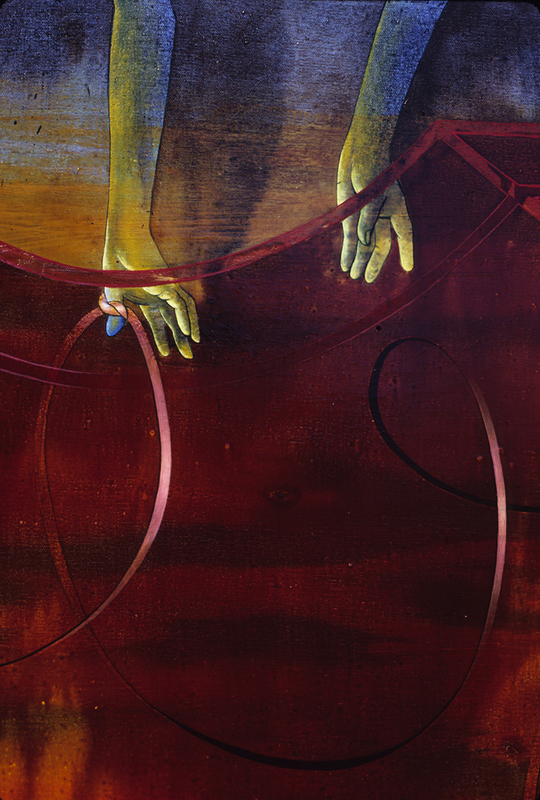 In Amnesia Embellished, the finger’s circulation was cut off in a wan struggle to remember. Here the tourniquet cuts off circulation in order to save the whole body, whether it’s the world with its gores or a single body with its extremities. The waist of the falling figure in distress, taken from Hieronymous Bosch’s Last Judgment, coincides with the equator, linking our personal destinies with that of the planet.